The picturesque coastal town of Kaikoura is located on a rocky peninsula on the northeastern coast of the South Island. With its dramatic backdrop, this small township is known as the place where the mountains meet the sea. In Māori, kai means ‘food’ and koura means ‘crayfish’, and we can’t think of a better place to eat freshly caught crayfish while enjoying the stunning view. If you prefer to simply watch the sea life rather than eat it, that’s also fine. Kaikoura is known for its marine mammal encounters. Whales, dolphins and fur seals live in the waters around Kaikoura and there are a number of ways to get up close and personal with some of them. And don’t those mountains look enticing. While it’s mostly advanced hiking in rugged backcountry, there are some easier walks both in the mountains and along the coast that anyone can enjoy. Here are approximate travel times and distances to and from Kaikoura. 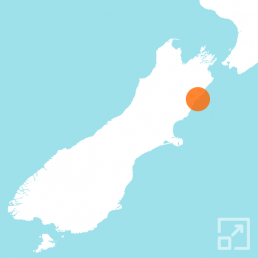 The Coastal Pacific which travels along the east coast between Picton and Christchurch, via Blenheim and Kaikoura, was severely damaged by the Kaikoura earthquake in November 2016. After extensive repairs, the route reopened in December 2018. Check the KiwiRail website for current operating times. While Kaikoura does have a small airport, this is currently for local flights only. The closest large airport is in Christchurch, approximately 2 hours 45 minutes drive south of Kaikoura. A number of international airlines including Emirates, Qantas, and Singapore Airlines fly into Christchurch. Check the Christchurch Airport website for details. Kaikoura has a relatively mild maritime climate with an average high of 19.1 °C / 66.4 °F and average low of 11.7 °C / 53.1 °F in summer (December – February). In winter (June – August), the Kaikoura Ranges are covered in snow but snowfall in Kaikoura itself is quite uncommon. The average high in winter is 11.6 °C / 52.9 °F and average low is 5.8 °C / 42.4 °F. Check current conditions and get the latest Kaikoura weather forecasts on MetService.com. Looking for ideas to help you plan the ultimate New Zealand outdoor adventure? Here are some of the top things for active travellers to see and do in the Kaikoura region. Kaikoura is most widely known for its marine wildlife encounters, specifically whale watching with boat trips leaving the harbour several times a day. For the more adventurous, a guided kayak tour could be a good option to watch fur seals hunting off the peninsula. For a truly unique experience, try snorkeling with fur seals in the shallow waters. Kaikoura offers a number of local walks ranging from a few minutes to several hours with the Kaikoura Peninsula Walkway being the easiest way to enjoy the scenery. If you’re looking for something more challenging, a return hike to the summit of Mt Fyffe will take you a full day but the view is worth it. Alternatively, the private Kaikoura Coast Track is a 2 day hike and the best way to truly experience the beautiful coastline.